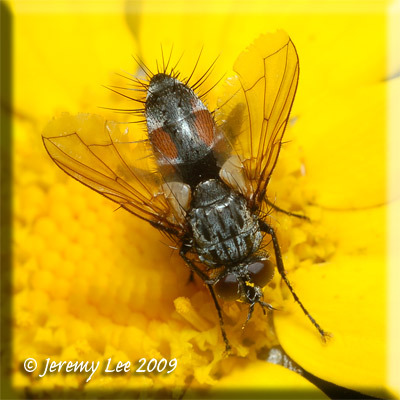 Eriothrix rufomaculata, more commonly known as a Tachinid Fly, is a bristly black species, with prominent orange patches on the sides of its abdomen, separated by a dorsal black line. Quite distinctive in the field with the orange abdominal side patches, slightly shaded wings and a silvery face with protruding mouth edge. The only species that you could confuse with this is the much rarer Mintho rufiventris but Mintho has a laterally-compressed abdomen and 2 broad black longitudinal stripes on the thorax - contrasting with rufomaculata's cylindrical abdomen and 4 narrow stripes on the thorax. The species is parasitic, the larvae developing inside the larvae of moths. Adults are flower-feeders, visiting in particular members of the Umbelliferae and Asteraceae. This species is common and widespread throughout the UK, and is also found in Ireland.